On Monday, 30th November, Ricoh announced that their Ricoh Pro C7110X series of production printers (with its fifth toner station that you can read more about here) has won the 2016 Buyers Laboratory (BLI) PRO Award. BLIs challenging production tests reveal the attributes that distinguish the most outstanding performers, and the Ricoh systems were the only models to earn BLIs 5-star rating for media handling since the production test programme began. Fifth imaging station offering a range of creative output not possible with four colour alternatives. 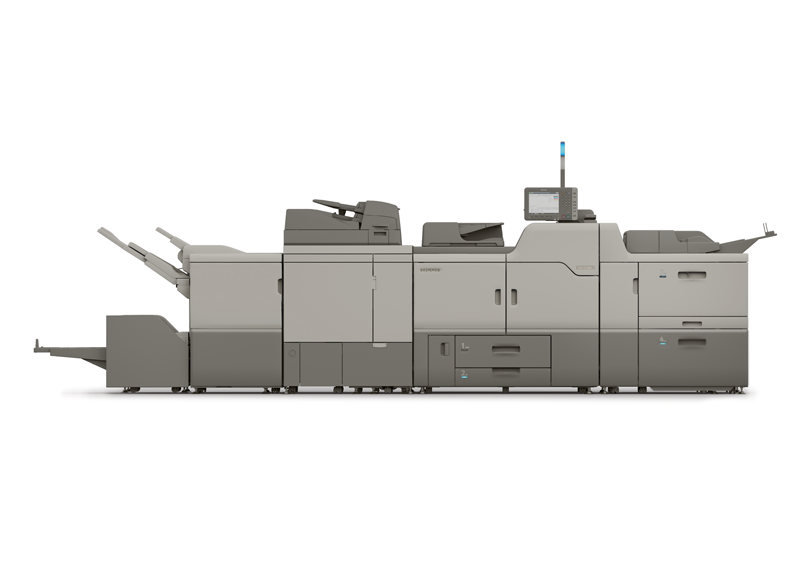 Excellent productivity especially with heavyweight media, maintaining its full 90 ppm engine speed with media up to 300gsm, surpassing the results of rival devices. Long, uninterrupted print runs thanks to a maximum paper capacity thats more than double the capacity of most rival units. Class leading array of inline finishing options including a perfect binder, full bleed square-edge booklet maker and inline ring bindery. Impressive colour consistency, with no colours shifting by more than Delta E 3.9 over the course of a 1,000-page print run on either coated or uncoated media. Best-in-class black solid density that also showed less variance on both coated and uncoated media than that of competitors in BLIs 100-page high-coverage test. "The Ricoh Pro C7110X gave a very strong performance in BLIs production field test. The fifth imaging station is a real game changer, clearly differentiating it from other cut sheet devices in its class, allowing for a range of creative options (such as spot coating on covers) not possible with four colour press alternatives." BLI Senior Analyst Ian Latham added, "The Ricoh Pro C7110X certainly deserves its 5 star rating not just for productivity but for media handling, with its support for media up to 350gsm in duplex, with full engine speed maintained up to 300gsm, not to mention support for printing banners up to 700mm in length, and a media catalogue with a high degree of customisability and tight integration with the EFI controller." If you would like more information on this award-winning series of colour, production printers and multifunctional devices please contact us and speak to one of our production print experts.